Create forms that match your brand's style with themes and templates. Use them as is or customize them to suit your needs. Personalize your forms and let your brand do the talking. Get a head start with templates. Experiment with shadows, transparency, colors, and patterns to create the best form theme for your business. Design forms that look great on all devices, including mobile. Reflect your brand identity throughout your forms by adding your company logo and customizing the design's colors and fonts. With complete control over all the elements of your form, make your brand stand out in the crowd. Forms that speak your language. Make sure all your communication counts. 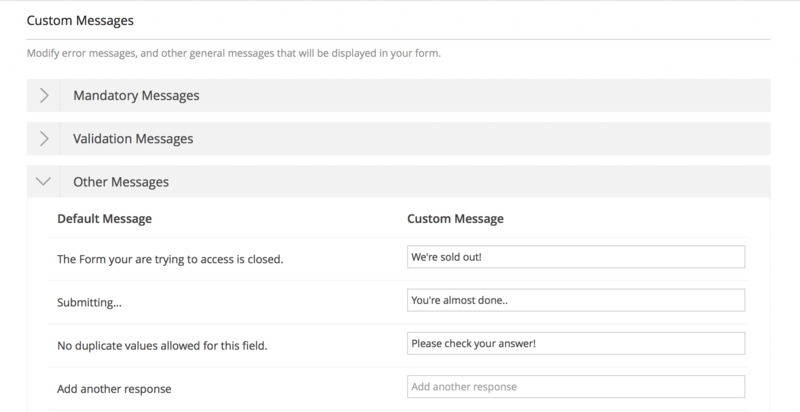 Customize every piece of information and error message that appears in your live forms and ensure they match your brand's tone.